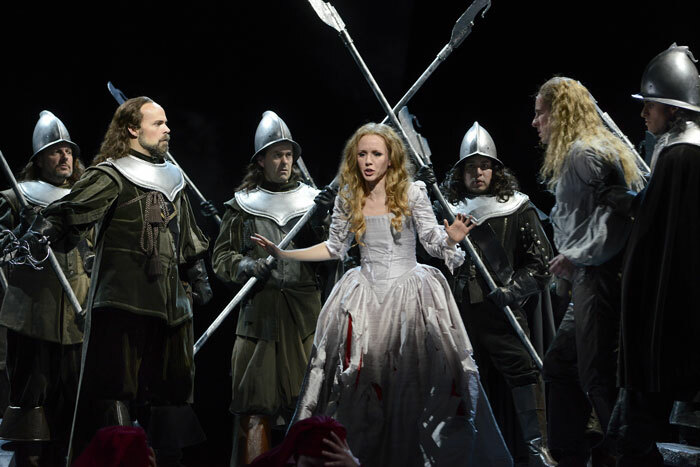 An article comparing two recent US productions of Bellini's I puritani in New York and Boston. It was Rossini’s idea to invite three up-and-coming Italian composers to Paris in a sort of unannounced competition to compose one opera each for the Théâtre Italien, where he was one of the directors at the time. Vincenzo Bellini came first when his I puritani debuted on 25 January, 1835. A few months later it was Donizetti’s turn with Marin Faliero, and third came Saverio Mercadante with his I briganti. Puritani was a brilliant success, so successful that it overshadowed Donizetti’s effort, and Mercadante’s opera was a failure, revived only in our time, last year at the Bad Wildbad Rossini Festival in Germany. Alas, a few months after Puritani’s triumphal premiere, Bellini was dead at the youthful age of 34. I puritani di Scozia (The Puritans of Scotland), to use the full title, has nothing whatever to do with Scotland, but Walter Scott’s Old Mortality is the ultimate source of the opera, and in France, the Scott novel was translated as Les puritains d’Ecosse. Scotland was a popular setting for Romantic works thanks to Scott, and putting it in a title boosted sales, even though the opera takes place in Plymouth, England, far to the south. The story is set at the time of the English Civil War in 1650, when King Charles I has just been beheaded by the Puritans under Oliver Cromwell. The fortress in Plymouth is a Puritan stronghold which contains our heroine Elvira, whose father is in charge. Elvira is loved by another Puritan leader Riccardo, but she loves a Royalist sympathizer, Arturo. In spite of the recent struggles, her father has agreed to let her marry Arturo, who comes to the fortress/castle for the wedding. He soon discovers that the deposed Queen, Enrichetta (Henrietta) is a prisoner at the fortress and he vows to help her escape. When he spirits her away (ultimately to France), Elvira thinks he has abandoned her for another woman, and she mellifluously loses her reason as she imagines that Arturo will lead her to the altar (“Vieni al tempio, fedel Arturo”--‘Come to church, my faithful Arthur’). The jealous Riccardo, who knows the real reason for Arturo’s departure, keeps silent. In Act II we learn from Elvira’s sympathetic uncle, Giorgio, that the poor girl is indeed whacko, and sure enough, she soon wanders in to sing the opera’s second mad scene, “Qui la voce sua soave” (‘It was here that his sweet voice’), one of Bellini’s most inspired and tenderest melodies. Like Lucia in Donizetti’s opera, premiered a few months later, Elvira imagines herself at the wedding in the cabaletta “Vien, diletto, in ciel la luna” (‘Come, my love, the moon is shining’). Giorgio then shames Riccardo into admitting that he knows why Arturo really left and finally gets him to promise to help Arturo should he come back. At the premiere in Paris, this multi-part baritone-bass duet was the hit of the show, ending with the stirring and much imitated cabaletta “Suoni la tromba e intrepido” (‘Let the martial trumpet sound and intrepidly...’). In the final act, Arturo returns and explains to Elvira why he left. Her joy (and regained reason) is cut short when Arturo is arrested as a traitor. She loses her reason again (! ), but word of an amnesty for all prisoners arrives in the nick of time, restoring Elvira’s sanity and leading to a happy ending and the union of the lovers. In the standard edition of the opera, the deus ex machina ending comes very quickly and everything is over before the audience has a chance to absorb the good news. Bellini must have realized that it needed some adjustment after the premiere because when he revised the opera for mezzo-soprano Maria Malibran, he wrote a joyous rondo finale for to conclude the work, but because he died so soon after the premiere (and Malibran died a year later to the day), it languished unheard for well over a century until Joan Sutherland’s husband, the conductor/musicologist Richard Bonynge found it in some unpublished Bellini manuscripts. (Others argue that Bellini himself cut it during rehearsals because the opera was too long.) He premiered the cabaletta with his wife singing in the 1970’s, and mostly it has been used since then to conclude the opera. Bellini’s librettist was Count Carlo Pepoli, an Italian patriot who had got into trouble in his home country and was living in exile in Paris. Pepoli was an amateur poet and librettist, unlike Felice Romani, a top professional librettist, who had worked with Bellini on most of his previous operas including Norma. Pepoli managed an adequate drama, though certainly not a brilliant one, but for Bellini the words--the poetry itself--was very important and always inspired his vocal line. He worked closely with Pepoli and they produced some very lovely Italian verse like “Qui la voce sua soave.” Bellini had what he needed. At its initial outing in 1835, Puritani had four of the five greatest singers in the world at the time in its cast: Giulia Grisi as Elvira, Giovanni Rubini as Arturo, Arturo Tamburini as Riccardo and Luigi Lablache as Giorgio. The opera was such a hit that they came to be called the Puritani Quartet, and they toured the opera in the major European capitals. Rubini particularly was an extraordinary tenor, albeit homely, and his high notes were legendary. Bellini composed a vocal line for him that went up to F above high C, and included more than one D, not to mention high Cs. The role makes Manrico’s “Di quella pira” seem like child’s play. Needless to say, not many tenors since have been able to sing it as written, and only when a quartet of super singers exists is I Puritani normally revived. In 1976 the Met revived it in a new production with Luciano Pavarotti and Joan Sutherland, and it is that 38 year old production that was pulled out of mothballs this year. Meanwhile a couple of hundred miles north, in Boston, a brand new Puritani was offered. I had not seen this gorgeous opera in many years, and the chance to see two different casts in two different productions within four days was too much to resist. Puritani is, musically, my favorite Bellini opera and to hear those marvelous melodies again was a treat not to be missed. At the Met, the fusty production by Sandro Sequi seemed very old fashioned. Painted drops (by Ming Cho Lee) accurately portrayed the settings as the libretto describes them, but it all seemed a bit moth-eaten. Likewise, the direction was for the most part of the static stand-and-sing variety, with some exceptions from the principal singers. The chorus marched in as a whole and stood together, sang, and marched out, as they did fifty years ago. There was no indication that they should act. Costumes (by Peter J. Hall) were very traditional if a bit more colorful that one imagines puritans wearing. The exceptions to the static acting were our Elvira, Olga Peretyatko and to a lesser degree her Arturo, Lawrence Brownlee. I have seen and heard the beautiful Ms. Peretyatko several times at the Rossini Festival in Pesaro, and there she had a wonderful voice with superb agility. While it did not seem lost in the huge Met auditorium, it seemed smaller and without its crystalline purity and on a couple of occasions a little flat, although she often mustered full volume for climaxes. She seemed to take her own way in acting the role’s three mad scenes, and darted around the stage, at one point leaping onto a bench, showing the same athletic ability I have noted in her comic opera roles in Pesaro. Her haunted portrayal gave a noted spark to the old fashioned production, as did her final rondo, “Ah! sento, o mio bell’angelo,” the one that Bonynge found. The other thing that sparked the production was Lawrence Brownlee’s suave singing. When Elvira sings her major Act II aria, she is singing about Arturo’s voice: “Qui la voce sua soave,” “Here I heard his suave [gentle] voice.” She describes Brownlee to a “T” because “soave” was a perfect adjective for his voice on the evening we heard him, like the light white Italian wine of the same name which goes down so easily. Arturo has what may be the most difficult entrance in opera; without any chance to warm up in Act I, he launches into “A te, o cara,” ‘To you, o dearest [I pledge my love]’. The tessitura starts high and remains there. It must be the vocal equivalent of climbing a ‘fourteen’er’, one of Colorado’s fourteen-thousand foot peaks. Indeed, before the evening is over, Arturo has to negotiate two D’s and an F above high C. Brownlee negotiated it all just beautifully, and without falsetto. His role is not as showy as a leading tenor role in Rossini, with its cascading roulades that make you want to leap to your feet when well done, rather it depends on a seamless legato to negotiate the long, long lines of Bellini’s incomparable melodies. Brownlee had that. In fact his singing was at least good as Javier Camarena’s had been the night before in La cenerentola. It is just too bad that a sold-out audience wasn’t there to demand an encore. You just don’t hear singing like that very often. 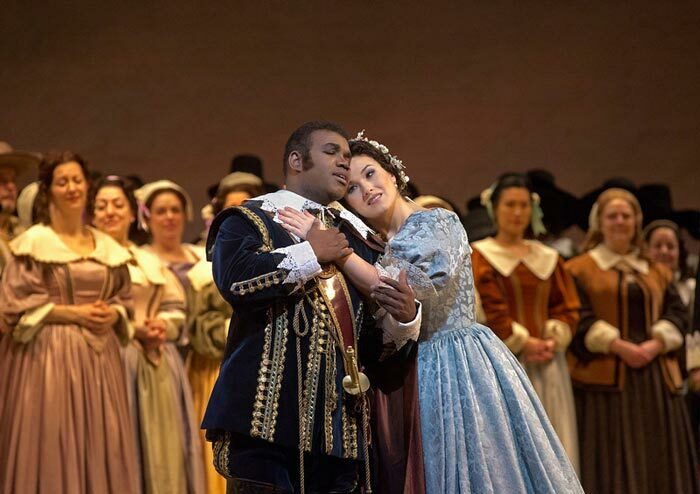 Lawrence Brownlee as Arturo and Olga Peretyatko as Elvira in Bellini's "I Puritani." The low voices, also very important in this opera, were taken by Mariusz Kwiecien (Riccardo) and Michele Pertusi (Giorgio). Kwiecien was supposed to be indisposed, but I could not tell it; he did not, however, sing the cabaletta repeat of his Act I aria. Pertusi certainly has the smooth legato asked of Giorgio, but he was sometimes overwhelmed by the orchestra. “Suoni la tromba,” however, was as rousing as it should be. Michele Mariotti (who happens to be Ms. Peretyatko’s husband and the son of the Director of the Rossini Festival at Pesaro) conducted the Met orchestra and chorus. He knows his way around bel canto opera. The stage director, Crystal Manich, worked with this dubious concept in dubious ways. For starters, Elvira is on stage when the curtain goes up (she is not supposed to be there), pointing accusingly at the audience and surrounded by the male chorus which opens the opera. Get it? She is surrounded by men. Soon, Giorgio comes on, towering over the diminutive singer, Sarah Coburn. When the female chorus emerges, it does so in the shadow and around the central playing platform which is the unit set for the production. Since you can’t get rid of the women, they are placed in shadow. They also do weird things with their hands while Elvira sings her Act II mad scene, although there is no reason for them to be on stage at that point. The idea escaped me there. Another very strange use of the female chorus was to have them march on wielding spears during the bass-baritone duet “Suoni la tromba.” Now what is that about? Instead of listening to the rousing music, there I am, trying to figure out just what the hell those women (amazons?) are doing twirling spears around while the men sing about the joy of being fellow soldiers. The worst travesty of the production was to turn Bellini/Pepoli’s happy ending into a tragic one. Just as news comes that the royalists have been granted amnesty, thus saving Arturo, Riccardo pulls a dagger from his boot and stabs Arturo in the back, thus depriving the soprano of her Bonynge-discovered rondo, and no doubt sending Elvira into permanent madness. At least it made me mad. I recall a production in San Francisco where Riccardo kills Elvira in the last moments (I think it was Elvira and not Arturo--it was a long time ago) in the end. Both were travesties. The production did odd things with the score too. At first, it seemed to be complete. Riccardo repeated his cabaletta (unlike the Met) and standard small cuts were opened, even some short repeats and phrases that I do not recall hearing before. So imagine my surprise when the first act finale cut the stretta after the big ensemble “Vieni al tempio,” which constitutes Elvira’s Mad Scene #1. The stretta (allegro section) is brief, but it brings the act to an appropriate close and stopping the act without leads to imbalance, just as ending the opera with Arturo’s gratuitous death goes against the happy allegro that Bellini composed for the finale--even without a soprano cabaletta. I don’t know if these choices were the stage director’s or the conductor’s, but with apologies to Lewis Carroll fans, “Beware dramaturg, my son.” If an opera company has a dramaturg, you know you are in for trouble! Personally, I wanted to boo when the production team came out (we saw it on opening night, May 2), but the polite Boston audience was already on its feet applauding wildly. Well, Boston-wildly. If I had booed, I was afraid I would be tossed into Boston harbor like so much tea. The simple platform set was backed by large panels in black and white with clouds or fragments of what seemed to be Roman triumphal arches. I suppose they were meant to suggest the fragmentation of madness. An old pro, John Conklin, was responsible for them. The costumes for the men were more puritanical than those that the Met used, but the women wore bright red dresses, which I guess was supposed to suggest something symbolic in a drama-turgid sort of way. What about the singing? I Puritani’s success or failure must ultimately rest on the quartet of singers as it did in 1835. Sarah Coburn sang Elvira. Hers is a bright voice with the requisite coloratura, without being exciting. I did find her exciting, however, in the cabaletta “Vien, diletto, in ciel la luna,” particularly in the repeat which she embroidered with taste and appropriate high notes. Too bad she didn’t get the final rondo. Ms. Coburn is a very thin woman in spite of having two young children, giving lie to the ancient notion that opera singers need physical heft for a voice big enough to fill a hall. Coburn might have trouble in a theatre as huge as the Met, but in Boston’s small Shubert Theatre, she was just fine. Her acting was more subdued than Ms. Peretyatko’s, but was good enough given the concept production. Boston’s tenor was John Tessier, a very tall man with long blond hair. His is a high, thin voice without a lot of support, but it is flexible and he has the terrifying high notes. For the high ‘F’ in “Credeasi, misera” he slipped into a head voice, but it was firm and attractive and seemed to flow seamlessly from his normal voice. Tessier has sung at Covent Garden (the Steersman in The Flying Dutchman) and will sing Nadir in The Pearl Fishers with ENO. His voice is not unattractive, but produces more of a tenorino sound than we usually hear in leading roles. I liked the Riccardo of Troy Cook, and the coloratura he introduced in the repeat of his cabaletta. Paul Whelan as Giorgio started off a little tight and swallowing his words in the Act I duet with Elvira, but by the time he got to his aria “Cinta di fiori” (‘Crowned with flowers’) he had relaxed and gave us a full and well supported sound. For some reason, he started to playfully flourish his sword in the “Suoni la tromba” duet, which was out of character, but maybe it was because he was surrounded by those spear-brandishing amazons of the chorus. I also liked Chelsea Basler in the small role of Queen Enrichetta; she actually acted it well, in contrast to Elizabeth Bishop at the Met, whose girth made it impossible to believe that she could be mistaken for Elvira as the libretto asks. David Angus conducted with a proper understanding of tempi. But what about that cut stretta? He shouldn’t have allowed that. Boston Lyric Opera plays in the Shubert Theater, a lovely old legitimate theater-house with bad acoustics which are no friend to the singers. The house is, however, intimate and it was full on opening night. The chance to see two Puritani’s within a week does not come along often, and a comparison of the two productions is inevitable, always remembering that a regional company like Boston Lyric does not have the resources of the Met. The Met had better singers overall, but Boston’s were certainly respectable in the smaller house. The Met’s old production (last trotted out for Anna Netrebko in 2006) is something of a downer and Boston’s production was just “off.” At the Met, it was Lawrence Brownlee who finally owned the show. Of course some of us remember our own Puritani Quartet from the last century when this Met production was new: Joan Sutherland, Luciano Pavarotti, Sherrill Milnes and James Morris. We are unlikely to hear anything like that again for sheer vocal beauty, but meanwhile we can always console ourselves with Bellini’s ravishing melodic genius. The real tragedy was his death at such a young age.